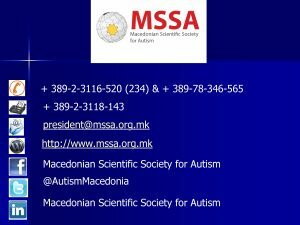 I am very pleased to inform you that on the great holiday, the Day of the Macedonian Revolutionary Struggle – 23 October 2018, the new website of the Macedonian Scientific Society for Autism was enriched with new contents, new photos and new events. Namely, why new? To be honest, we had no plans to make a new one. But because of the big accident that happened with our former hosting that was going through the company Ars Lamina, who changed the servers, and their webmaster did not update it regularly, it was not back up and we stayed with an old website updated until 2011. Great drama for us with lost lot of data, files and the like. After a couple of weeks of negotiation, will they find a solution, but once I see that they are powerless, I decided to make a new web site and I asked my dear friend and web master Gjorgji Pop Gjorgiev to the magazine JRDDD, which without hesitation accepted and in 15 days we have a new web page. On this occasion I owe him great gratitude to him, but also to the colleagues from Ars Lamina who, although they made us irreparable damage at the moment, still have been hosting our web site for five years. I would like to apologize here (because, it was no our fault, we were not available) to all those who visited our domain in recent weeks and watched old content or an empty page. I sincerely hope that you will like the new website, for which I invite you to visit the above link.